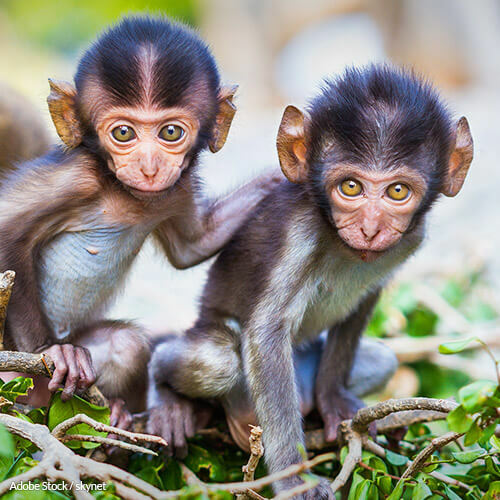 While there's no denying how adorable a baby chimpanzee or spider monkey may be, efforts to contain these animals as pets are as shortsighted as they are costly. The Journal of Applied Animal Welfare Science has stood behind research that categorically labels nonhuman primates as unsuitable for private ownership since 2008 . The American Bar Association supports even more sweeping standards, adopting a resolution in 2015 supporting laws prohibiting the "possession, sale, breeding, import, or transfer of dangerous wild animals, such as big cats, bears, wolves, primates, and dangerous reptiles" . Yet, the primate trade continues to operate in the United States. According to National Geographic, anything from macaques to marmosets, and even endangered species, can be procured for upwards of $50,000 . But no matter how cute or clever, keeping a primate a a pet can set that animal up for serious frustrations in life. "If you try to keep them as pets you're creating a mentally disturbed animal in 99.9 percent of the cases," said Veterinarian Kevin Wright, director of conservation, science and sanctuary at the Phoenix Zoo in Arizona. "The animal will never be able to fit in any other home. Never learn how to get along with other monkeys. And, more often than not, will end up with a lot of behavioral traits that are self-destructive." Beyond primate personality problems, the bacteria these animals are capable of carrying can prove deadly to humans, and vice versa. Some monkeys are capable of transmitting the Herpes B virus, which can lead to severe brain damage or death, according to the Centers for Disease Control and Prevention . "By definition, a pet is an animal we touch and play with in our homes and in no way is it in a primate's best interest to be constantly touched and played with by people. They need their own social groups, are extremely hard to care for and often grow up to be aggressive and impossible to control," said veterinary surgeon and CEO of Twycross Zoo, Warwicks, Dr Sharon Redrobe to The Guardian . "Owners then take them to a vet, expecting them to be magically 'fixed'. They're wild animals and, in that respect, no different to tigers. You wouldn't keep a tiger at home, so don't keep a monkey." The legislated protections for primates in the U.S. come primarily from the Animal Welfare Act, which merely requires enclosures be of a certain size , but place no restrictions on the sales or transport of the animals. The dangers of keeping a primate warrant a nationwide ban on the ownership of any primate as a pet, no matter the species. Sign below to demand the U.S. Department of Agriculture, the Senate Committee on Agriculture, and the House Committee on Agriculture work together to put a full ban on owning primates as pets in the U.S. The practice of taking in primates as pets, apart from posing serious threats to the health of both the animals and their owners alike, is foolish and irresponsible, and deserves to be prohibited within the United States. Apart from the high costs and unexpected damages that come with primate ownership, humans with such pets are at a greater risk of catching the deadly Herpes B virus, and leaving the animals they intend to care for with long-lasting psychological issues. No matter the species, whether a capuchin, spider monkey, macaque or marmoset, primates are wild animals, and belong in a wild habitat. They simply cannot flourish in a human home, yet the unscrupulous trade and transportation of these animals continues in our country to this day. According to National Geographic, it's anything but difficult to find a primate for sale online, even some of the more endangered species can be procured for upwards of $50,000. And the Animal Welfare Act, the U.S. clearing house of animal protection rules, lends hardly any sense of security to primates, only dictating the minimum enclosure size. People who take in primates as pets often wind up wishing they hadn't, with nothing but a pet in poor health and a home in disrepair. The dangers of keeping a monkey are more than enough to warrant a nationwide ban on the ownership of any primate as a pet, no matter the species. I urge you to put this ban before a congressional committee immediately, and help us prevent any more needless suffering. That's 5,732 signatures! Let's keep the ball rolling.